Food @ GregsHead.net – Page 3 – Food is good. We like food. This weekend we had some friends over to eat. We call it the Food Fest and host it every year in July. Showcasing some of our favorite foods in ridiculous quantities, just for fun! This year we decided to have a very specific theme: Garbage Plates! 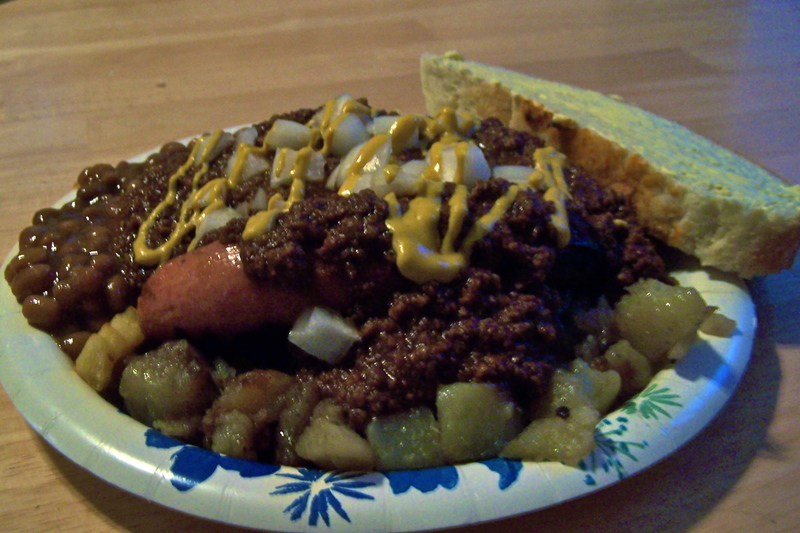 The original “Garbage Plate” is from a local eatery named after it’s owner, Nick Tahou’s. It features most of the foods you can find at any local diner, all piled up together on a plate, served with a couple slices of fresh bread. It’s fantastic! I got the recipe through a friend, and thought I’d share it here as well (with my modifications…) It made for a great summer party meal! (And is just ridiculously filling!!) Note: I did triple the ingredients below (except for the onion) for a party of about 20 people, half kids. Grill up your favorite meat, and when it’s ready here’s the order for piling up the delicious food on your plate: (Large paper plates worked well for us.) First, add about 1 cup each of Mac salad, baked beans (COLD, not hot), and either home fries or french fries (your choice… some of our guests had both!) Next, add the meat. Two pieces. Next cover the plate with a ladle-full of the special sauce from above. Add some diced onion and crisscross the plate with mustard. Serve with two slices of fresh bread. Posted byGreg March 4, 2010 August 11, 2017 Posted inBreads, Main Dish, Regional Foods, Side DishTags: Sandwich, VenezuelanLeave a comment on Arepas! Mix in garlic, onion, cilantro and adobo, and cover beans. Simmer on low to medium heat, stirring occasionally for 20-30 minutes. The longer (and slower) you simmer, the better the flavor and consistency. Should be thicker when it’s ready to serve. The amounts above are definitely approximations. Add each/all of those ingredients to your taste preferences. But that combination, simmered to perfection… a fantastic part of pabellón! When I was a kid, my family moved to Caracas, Venezuela. It was quite an experience, living three years of my youth in a foreign country. I learned the language, absorbed some of the culture, and acquired a taste for the food! Now, as an adult, one of our favorite meals to make is pabellón criollo—the Venezuelan national dish! I don’t always make the full meal, in fact, I almost never include the platanos [plantains]. (That’s just a personal preference.) But even when we just make parts, it’s fantastic! 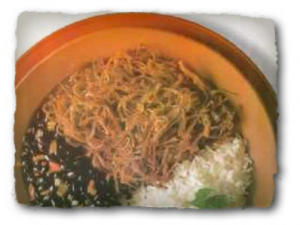 I will post each part of the meal separately here, starting with the recipe I use for the carne mechada [shredded beef]. Place the meat crockpot with about a cup of water, medium onion, and a little salt. I add adobo and olive oil as well. Cook on low for many hours until tender, pulls apart easily. Turn crockpot off, remove the meat and let it cool so you can shred it with your hands. Do not dispose of the liquid. In a large pot, put just enough oil to cover the bottom. Heat up the oil and begin sauteing the garlic, onions, cilantro, pepper(s), and celery. Let it cook till all smells great, but do not burn the onion and garlic. After these have simmered for a bit, add the tomatoes and simmer a bit longer. Add the shredded meat and let it simmer a while longer. Now add the beef bullion, and the liquid from the crockpot. You can add a couple cups of water as well. Stir this up and let it simmer for as long as you can, as this will let the flavors cook together. Making it delicious! Today’s “recipe” is more of a “how to.” Lomitos are a sandwich that is common in Argentina. We have a friend from there who has familiarized us with some of the cultural favorites of her country, and this is one of the Campbell family favorites! Enjoy! Once the meats and egg are ready, assemble the sandwich. 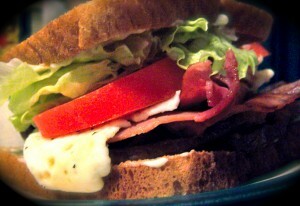 Mayonnaise on both slices of bread, then steak, ham, egg, lettuce, tomato. It’s that easy, and it’s delicious!